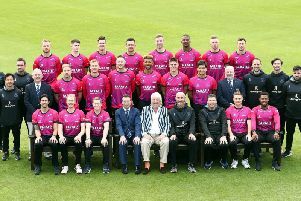 It was a day for the purists in Royal Tunbridge Wells where bowlers toiled in the heat and dirt while Kent’s batsmen played the ball on its merits to reach 310 for three on the opening day of their Specsavers County Championship clash with neighbours Sussex. A sluggish, two-paced pitch coupled with an outfield at The Nevill Ground that could do with a good mowing ensured an honest battle between bat and ball and, with great joy, the introduction of leg-spin before lunch as the visitors vied for a second breakthrough. Kent certainly won the cat-and-mouse tussle of day one courtesy of a second-wicket stand worth 162 in 57.2 overs between Joe Denly (78) and Sean Dickson (81) who could only muster 12 boundaries between them. Dickson, Kent’s top-scorer on a hard-working day, said: “Joe Denly and I had a chat when we were batting and we came to the conclusion that the pitch was two-paced and seemed a bit quicker from the bowlers from the Pavilion End. Dickson added: “I’ve been getting decent starts of late without going on beyond 50. Okay, I didn’t bat on to reach three-figures today but, looking at the bigger picture, I’ve at least helped set us up nicely for a big total. Batting first after winning the toss, Kent lost their makeshift opener Adam Ball to the 10th ball of the match. Standing in for Daniel Bell-Drummond who is away on England Lions duty together with Sam Billings, Ball drove at his fourth ball of the day from Chris Jordan to edge to Ross Taylor at first slip and depart without scoring. Denly and Dickson saw off the new ball pairing of Steve Magoffin and Jordan, then Stu Whittingham’s first delivery of the game proved eventful, a beamer, it flew over Joe Denly’s head for six no balls leading to an official warning from umpire Nick Cook. The hosts re-grouped either side of lunch through Denly and Dickson who set out their stall to bat time. Playing back, the South Africa-born player in two minds against a short delivery and only succeeded in spooning it to Will Beer positioned in the gully. After batting over four hours Denly was also guilty of giving up his own wicket. Aiming to pull a length ball from Whittingham, he skied a top-edge to Taylor at mid-wicket to make it 199 for three. It proved to be the last success of the day for Sussex. Northeast and Stevens dug in through to stumps, Northeast passing his 50 in 77 balls while Stevens posted his first-half century since mid-May from 75 deliveries and with six fours and six.